With three chart-topping albums under his belt and an MBE to his name, Ed Sheeran is arguably one of the biggest musicians in the world right now. Coming to his Divide tour straight off the back of the album of the same name, Suffolk-raised Sheeran has every right to be pleased about his musical success - something which is certainly not showing any signs of slowing down any time soon! Named as 2017's bestselling global recording artist, 2018 has continued to be another outstanding year for the 27-year-old singer-songwriter. Sheeran's eagerly-awaited Divide tour, the tour accompanying the hit album, officially kicking off in March 2017 in Turin, Italy. 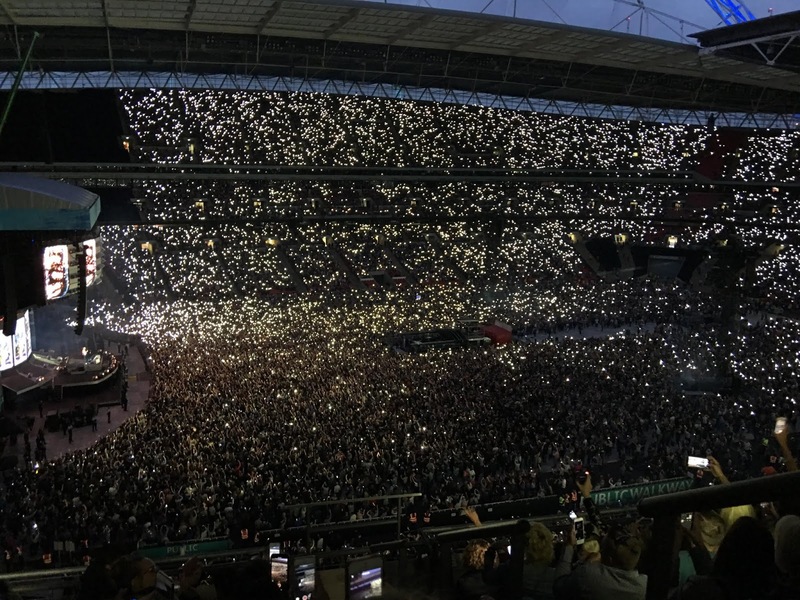 Returning to the UK for the second British leg of the tour (the first taking place in April/May 2017), the sell-out stadium crowd at iconic Wembley were waiting with bated breath for Sheeran to take to the stage. Heading along for the final night of Ed's four-night residency at the stadium, spirits were high and the air of anticipation among fans heading to the venue was tangible. This was my first time visiting Wembley Stadium for a music event. Although I've previously been multiple times for American football games, the feel is completely different when the hallowed Wembley turf is hidden away! Although the large capacity is handy and the atmosphere undeniably electric, it's clear that the stadium wasn't designed to maximise sound quality. Wembley's circular design almost seemed to distort the sound, bringing waves of music and crowd noise all around you in an inescapable whirlwind of audio overload. It's just as well that everyone was too engrossed in dancing and singing along to mind! Before the main event, we were treated to not just one, but two support acts. The first was Jamie Lawson - a personal favourite of mine and an absolutely lovely guy. The second was popular English singer-songwriter Anne-Marie. Although I like some of her songs, her music isn't really my cup of tea, but luckily, it wasn't long before the stage was set and the crowd were poised ready and waiting for Ed to begin. Unceremoniously arriving on stage with a short behind-the-scenes live video, Sheeran was immediately greeted by an ear-splitting roar of sound. Fans who had queued up for hours outside the stadium, standing in line to secure front-row spots, screamed their adoration and appreciation at the top of their lungs. Even high up in the stands where I was sitting, anticipation for what was to come filled the air. Despite being just one man armed with a guitar and a loop pedal, Ed Sheeran truly managed to fill the impressive venue of Wembley Stadium. Sheeran is renowned for his one-man-band approach to gigs and famed for his dedication to performing solo on tour dates. In his own words, "if it isn't broke, don't fix it!" The setlist featured a carefully pieced together mixture of old classics and new favourites, with long-standing crowd favourites like Lego House, Sing and Thinking Out Loud, the most well-received song of the night, performed side-by-side with Divide tracks including Galway Girl, opener Castle on the Hill and, of course, Shape of You. Effortlessly flicking between emotional heartstring-tuggers and bouncier floor-fillers, the arrangement of the setlist was a real work of art and a surefire credit to Sheeran's skill as a songwriter. Leaving the stadium and seeing Wembley's infamous arch lit up in Divide blue, there was a real party atmosphere as the crowds dispersed and headed home. Since fighting to get our hands on these tickets, we waited almost a year to see the icon that is Ed Sheeran performing live at one of the most recognisable venues in the country, if not the world, and it's pretty safe to say that 17th June 2018 is an evening I will not forget any time soon! Have you seen Ed Sheeran live? Did you head along to see him on the Divide tour? Let me know in the comments below!